Priyanka Gandhi Vadra’s entry into politics was said to be a longstanding demand of certain sections in the Congress. 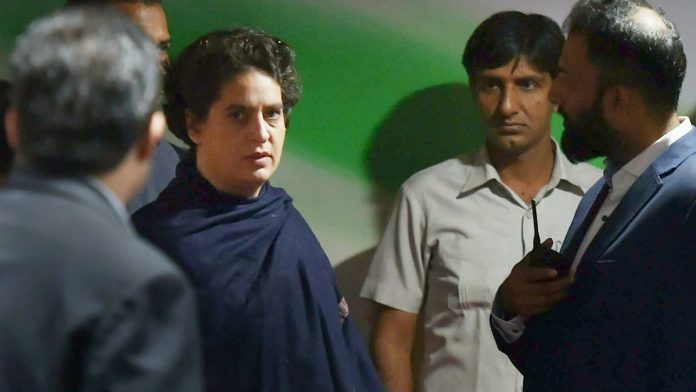 New Delhi: The Congress Wednesday appointed Priyanka Gandhi Vadra, as the general secretary in charge of Uttar Pradesh east, a development that marks her much-awaited entry into active politics. The appointment, months before the Lok Sabha elections, is significant as it comes close on the heels of the Samajwadi Party and the Bahujan Samaj Party (BSP) forging an alliance in Uttar Pradesh without the Congress. So far, Priyanka has restricted her political role to the constituencies of her brother and Congress president Rahul Gandhi (Amethi) and mother Sonia Gandhi (Raebareli). The area Priyanka has been given charge of is quite significant as her campaign will centre on east UP, home to Prime Minister Narendra Modi’s Lok Sabha constituency, Varanasi, and CM Yogi Adityanath’s stronghold and former parliamentary seat, Gorakhpur. “This is part of the strategy planned by the Congress president and this will rejuvenate the party workers too,” said a senior Congress leader. The party has also given the charge of Uttar Pradesh west to Jyotiraditya Scindia. “Uttar Pradesh is a major state for us and the Congress is putting all its energy in it. Other major changes will be done soon,” said another leader. Rahul Gandhi is undertaking a two-day tour to Amethi, where he is likely to meet party workers to take stock of preparation. The party had fared poorly in the 2014 Lok Sabha election, only managing to retain Amethi Rae Bareli among Uttar Pradesh’s 80 seats. Family enterprise appoints more directors from the family; get ready to submit to dynastic rule in one of the largest democracies in the world. I think the planning is more long term, and it covers a lot more than eastern UP. If things unfold the way the family would like them to, Shri Rahul Gandhi will be PM and Ms Priyanka Gandhi will be Congress President. She is being inducted at a time when Rahul Gandhi has won his spurs, so this will not be seen as undermining his authority. She also has grown up children to carry the family legacy forward. To complete the idyll, Arnab Goswami will take up cultivation of organic tea in Assam. ITS INDEPENDENT INQUIRY BY GOVT SEMI GOVT AGENCY. THEY HAVE THEIR OWN INDEPENDENT POWER TO DECIDE WHAT TO DO IF INFRINGEMENT OF LAW IS DONE. THERE R COURTS WHO DO NIT WORK UNDER GOVTS POLITICAL PRESSURE. ACCEPT THE FACT THAT THIS IS DEMOCRACY AND WHAT IS HAPPENING CAN HAPPEN WITH ANY FRAUDULANT ACT BY ANY ONE LIVING IN THJS COUNTRY. SO STOP BLAMING INFLUENCE OF GOVT. BY DOING SO YOU R INSULTING GOVT AGENCIES OUR COURT SYSTEMS. FOR GETTING YOUR AMBITIOUS THIRD GRADE POPULARITY BY USING BASELESS BRAINLESS NEWS, DO NOT IMPOSE ON US THE PUBLIC YOUR NONSENSE CONCLUSIONS.